I cannot even begin to tell you all how excited I am about my first giveaway! To say I’m pumped would be an understatement! 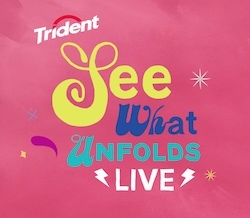 Last week I was contacted by Trident Gum about their “See What Unfolds” Initiative. They have brought two major musical entities, World Famous Duran Duran and Internationally Known DJ Steve Aoki together for one of the most amazing collaborations I’ve ever heard “Hungry Like the Wolf: Steve Aoki vs. Duran Duran- The New York Werewolf Mix”!!!!! You must watch This Video!! You cannot listen to this song and not get pumped! It’s the track I want to hear when I’m going out with my girls for a night of dancing!